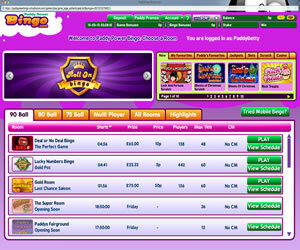 Paddy Power Bingo has been going since 2006 and the experience shows, as this is a very slick and popular site. Even if you're brand new to playing bingo online you'll soon feel right at home with the help of various tutorial videos. A lot of thought has gone into the design of the site that makes your life easy, as you don't have to waste time searching for anything. The bonuses are good and there are tons of promotions. Get Star Points as you play which you can use to convert into bonuses, and with 4 different Star Levels the higher you get the better your rewards will be. Be named Roomie of the Week and win 20,000 points and send in photos of your pet and win 5 BBs if they are chosen to be Pet of the Week. Make a date in your diary for the Bingo Linx games with £8000 getting paid out every day. You'll find 1TG, 2TG games as well as BOGOF and BOG2F. If you don't get lucky why not head for the Last Chance Saloon to see if you can win with a scratchcard bonus instead. Keep an eye out for Roll On Bingo where prizes will be awarded after the full house has been called. Tickets start from a very budget friendly 1p and there are 2 hours of free bingo every day of the week. 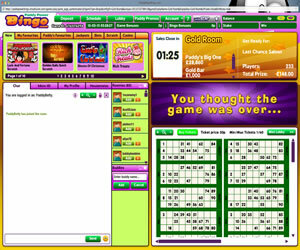 The lobby is organised under the different types of bingo you can play but you can then choose to sort by factors such as when the next game starts, the prize money and how much tickets cost. If you're impatient you can even play mini games whilst you're waiting for your bingo game to start. Your numbers are marked off automatically so you can relax knowing you won't miss out if you're doing a few things at the same time and you can play in up to 3 rooms at the same time. We like how there are different options to buy your tickets and the pre-buy feature is very handy. The registration process is very quick so you'll soon be playing your favourite game. If you like mixing things up you'll be pleased at the variety of games offered as you can choose from 90 ball, 80 ball and 75 ball bingo, as well as Speed Bingo and Deal or No Deal Bingo. There are lots of rooms just waiting for you so whatever you need you'll be able to find. These include lots of guaranteed jackpot games so you know exactly what you can win. Make sure you don't miss out on some extra cash by opting to receive bonus information by text or email. If you fancy trying something different you'll love the great mix of side games Paddy Power Bingo offers. There are some brilliant slots games and progressive jackpots that will see a huge jump in your bank balance. You might fancy your luck at the easy to play scratch cards, casino games with the glitz of Las Vegas and Novelties, which you'll recognise as instant win games. We think Paddy Power Bingo is a great site that offers something for everyone '“ now you just need the luck of the Irish to win! 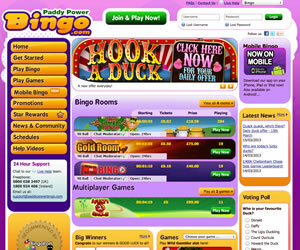 Paddy Power Bingo offers their players a selection of bingo games; there are the standard 75, 80 and 90 ball games found at all Virtue Fusion brands as well as the themed bingo games like Lucky Numbers Bingo and Deal or No Deal Bingo. 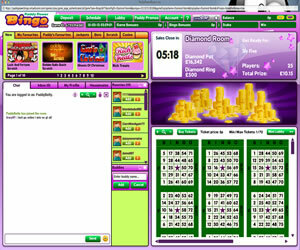 Alongside these you will also find a selection of instant win games, some of which can be played in the same window as your bingo. Wagering is considered met at Paddy Power Bingo the moment your cash match bonus is released.